Peeta Mellark was probably the most unsteady character. At times he was charming, genuine, and hilarious. At other points, though, the acting fell flat. I like Josh Hutcherson, but I couldn’t help feeling like I was watching an actor recite his lines. I was surprised to find that I liked the Head Gamemaker, Seneca Crane, he of the weird beard (I mean, check that thing out). Not so much in his role as gamemaker, when he’s trying to kill children. But in his scenes with President Snow, the character undergoes a marked transformation; he becomes unsure of himself, vulnerable, and that’s a testament to Wes Bentley as an actor. Caesar Flickerman, the blue-haired TV personality, added much-needed comic relief. He managed to be funny and empathetic while interviewing 23 potential victims and one eventual victor. In a way, he’s the most sadistic element of the Hunger Games. Gale is Gale. He wasn’t featured much at all in this first installment, but he’s as I imagined him: big and hunky. 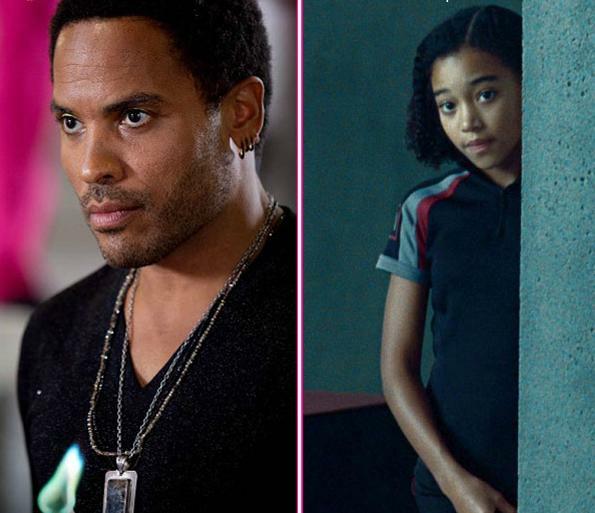 As to the controversy over Rue and Cinna being black, all I can say is that Rue is adorable (especially when she smiles), and Cinna is perfect. I almost view the Capitol as its own character. It and everything that comes with it is, in a word, magnificent. The absurd and colorful makeup and clothing, a la Lady Gaga, the extravagance, and the future technologies were all breathtaking. Is the Hunger Games movie better than the Hunger Games book? No. But it’s the best adaptation I could have hoped for. One way in which the movie was more impactful than the books: even though it was PG-13 level violence, it still felt more overwhelming to watch than it was to read. The horror of kids killing kids struck me in a way that the books never did. However, at (almost) 2 1/2 hours long, the movie couldn’t possibly be any longer, which might be why a number of things were changed or left out. The books delved much more deeply into the characters. There were two points that most stood out to me. Haymitch: Haymitch, Haymitch, Haymitch. In the book he’s a terror. Drunk. Obnoxious. The worst mentor imaginable…and eventually he matures as a character. In the movies, Haymitch starts off that drunk/obnoxious…and then miraculously transforms into a mostly pleasant guy for the rest of the movie. I also didn’t like the use of shaky-cam footage during some of the action scenes – it wasn’t easy to see what was going on, and made my head hurt. Overall, great movie. Love the actors and loved seeing the book translate to the big screen. Which do you like better – the book or the movie? The book was a running monologue in a 16 year old girl’s head (aka “clarissa explains it all”) in a gladiatorial setting. No description, no feelings; just plot. The movie was actually a believable story. The director and screenwriters filled in where the author failed by adding in detail and emotion. What I’m saying is that I completely disagree with you. Book=bad. Movie=good. Well, we actually don’t disagree completely – I really like the movie, too. I just feel that the movie was a bit more tidy and Hollywood-y (specifically with regard to Katniss and Peeta’s relationship) than the book. Finally! I agree with you, man. The only way I think the movie could have done a better job, would have been to not make the movie at all. I am no 16 year old girl, but the book was really intriguing, and really drew my attention. The movie….not so much. Besides for the lack of character development, the lack of interwoven relationship complexities, they just told the story (or tried to). Without the good bits! What were they thinking? That they want to make money? 😉 I think it really helped that a lot of time passed between when I read the books and watched the movie.